NRA President David Keene will be speaking at the Conservative Forum for Hawaii at 7:00pm Monday, 12 November, at the Naniloa Hotel’s Crown Room. This is the first time a sitting NRA president has ever visited Hawaii in an official capacity. The Forum is inviting everyone to this unique free opportunity to the talk on 2nd Amendment issues of importance to all citizens. In 2010, the Supreme Court ruled that the 2nd Amendment provides Americans a fundamental individual right to bear arms that cannot be violated by state and local governments, in a long-sought victory for gun rights advocates. However, the 5 to 4 decision does not strike down any gun-control laws, nor does it elaborate on what kind of laws would offend the Constitution. There are multiple other lawsuits pending around the country that will further define the limits and extent of gun rights for citizens. Mr Keene will speak on this topic, as well as pending legal issues concerning concealed carry laws. 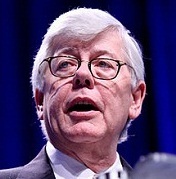 Mr. Keene, the son of Wisconsin labor organizers, is former chairman of the American Conservative Union, sponsor of the annual national CPAC conference. He is an attorney, columnist, political activist and lobbyist who has worked in the White House and Congress and has been involved in nearly every congressional battle over gun rights since the early 1970s. On Sunday 11 November he will be attending the Hawaii Friends of NRA Oahu Dinner at the Officer’s Club at Kaneohe Marine Corps Base Hawaii where he will present awards to the new 2012 Hawaii Varsity State Air Rifle Champions. Monday morning he will be meeting in Kona with Island of Hawaii Friends of NRA for a briefing on the West Hawaii Public Range project, and Monday evening he will address the Conservative Forum in Hilo. Contact Conservative Forum President Walter Moe 966-5420 for more information.